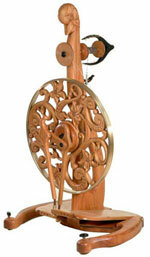 A Golding heirloom spinning wheel is a "castle" type wheel with scotch tension, hand built out of the finest cherry or black walnut. 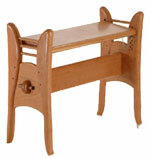 It is a synthesis of fine woodworking, woodcarving, sculpture, and precision balance and engineering. The machined bronze alloy ring that surrounds the wheel acts in a similar way to the bronze ring that surrounds the whorl on Tom's drop spindles. 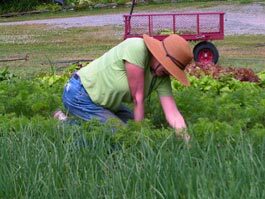 It creates an efficient placement of weight that allows for even and balanced treadling. The numerous custom sealed ball bearings mean you will never have to oil a Golding Spinning Wheel and the dynamically balanced flyers enable smooth spinning at high speeds. The Triple Flyer Model has a built-in Lazy Kate. 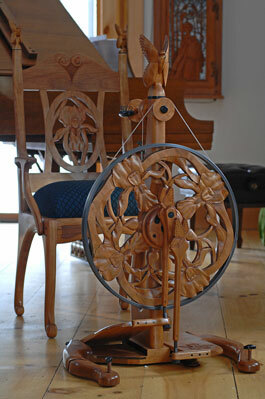 A spinner can 2-ply right on the wheel without having to remove the bobbins. 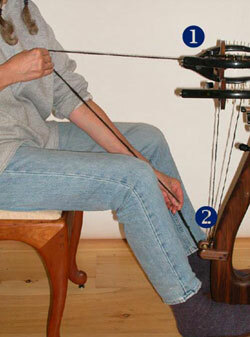 Singles from the two outside bobbins are threaded through the plying axle (2 in photo), then drawn up and plied onto the middle jumbo bobbin (1 in photo).